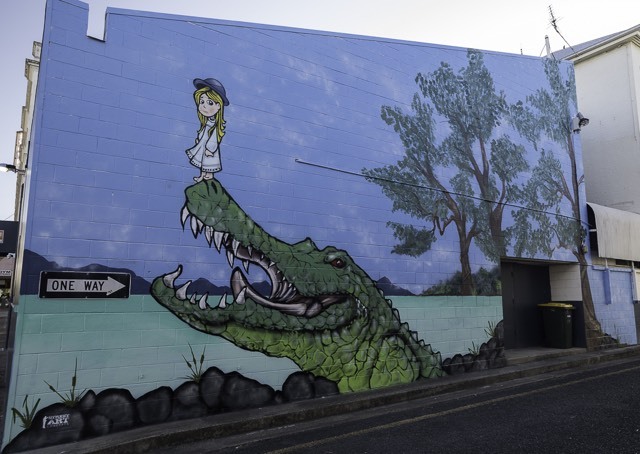 A photograph of a girl sitting on a 4m crocodile at the turn of the century was the inspiration for this street art project. It’s believed the photo was taken after a crocodile was shot in the Mary River by Walter McIndoe and displayed by the Cran family at their Iindah sugar plantation in 1903. Mclndoe is said to have fired at the croc from his River Road property causing it to launch itself into the air and disappear. Sometime later, brothers punting timber down the river pulled the croc from the shallows while investigating a strange smell. It was put on display and contributions to a collection box ingeniously placed by Mrs James Cran raised significant funds for the local hospital appeal.